The Windarra region forms part of the Mt Margaret Goldfield. Mafic and ultramafics, metavolcanics and intrusives form important members of the Windarra greenstone belt. A major granitoid pluton has intruded the stratigraphy and has locally stoped out the main BIF. Mafic-ultramafic and BIF xenoliths thought to be stratigraphically equivalent to the Windarra sequence occur within the granites in the region. Economic nickel mineralisation in the Mt Windarra area is hosted at the base of the Windarra Ultramafics, a 100–300m thick sequence of ultramafic (komatiite) lava flows, overlain by basalts. 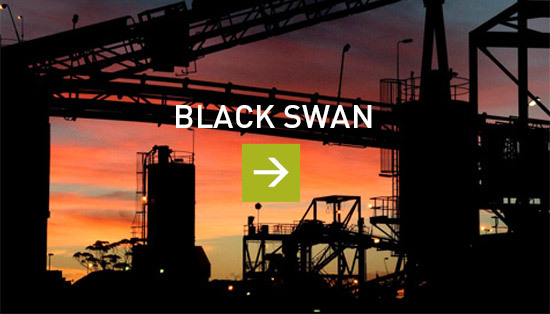 The Windarra Ultramafics host four significant nickel deposits, two of which have previously been mined, the Mt Windarra underground mine and the South Windarra open-pit and underground mine. The third discovery was at Woodline Well which has a small near surface oxide deposit which may contain a deeper sulphide extension. The latest and most significant discovery made by Poseidon Nickel in 2009 was at Cerberus where 68,600t of nickel metal has been drilled, modelled and resourced. The mineralisation is open at depth. Nickel mineralisation at Mt Windarra is restricted to the sulphide zones at the base of an olivine cumulate ultramafic sequence. Massive sulphides form the dominant ore type and the non-massive sulphide mineralisation can be sub-divided into three different textural types: matrix (25-40% sulphide), blebby (20-30% sulphide) and disseminated (between 5-25% sulphide). In the primary ore, pyrrhotite, pentlandite, pyrite and chalcopyrite are the most common sulphide phases, in decreasing order of abundance. The pyrrhotite to pentlandite ratio varies from 1:1 in disseminated ore, to up to 8:1 in the matrix hosted ore. The average nickel to copper ratio is 9:1 for most ore types, though may be as low as 4:1 in the copper rich basal matrix hosted ore and remobilised massive sulphide stringers. The Mt Windarra orebody consists of nine distinct, steeply dipping shoots named: A, A Hanging Wall, B, C, D, E, F, G and H Shoots as depicted below. These shoots vary from 2m up to 20m in thickness; have a strike length of between 50m and 350m and a down dip extent of greater than 900m. The diagram below shows the Mt Windarra Nickel Deposit depicting the remaining lodes that have not yet been mined out and form the JORC (2012) compliant Mineral Resource. The digital application of the model to Mt Windarra resulted in a much better understanding of the geology, geometry and resulting sulphide accumulations. This led much better targeting, optimised drill spacing and a significant upgrade the resource after limited surface drilling. 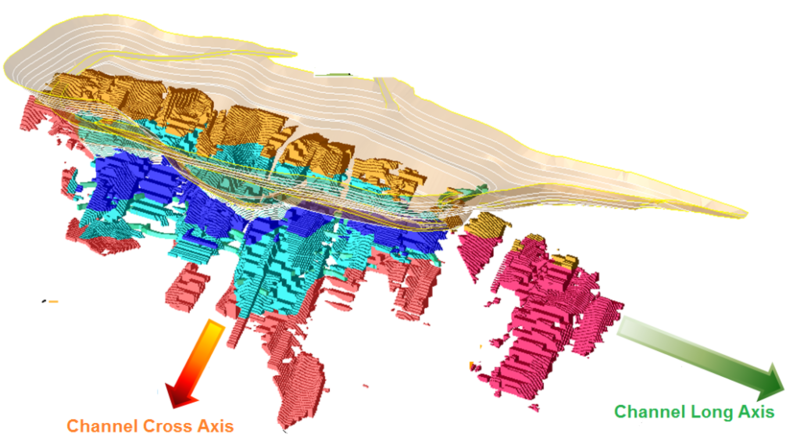 In addition the rendering of all historic data in 3D meant that the Kambalda Model could be applied in real space to the geology with meaningful results. The plan below shows the lava channel at surface where Poseidon’s mapping defines the channel edges. Potential for sulphide mineralisation exists to the south some 700m past the last surface expression of mineralisation in the B Shoot. This area has not been adequately drilled. Plan view of the mapped geology at Mt Windarra showing the channel edges, North is to the left. 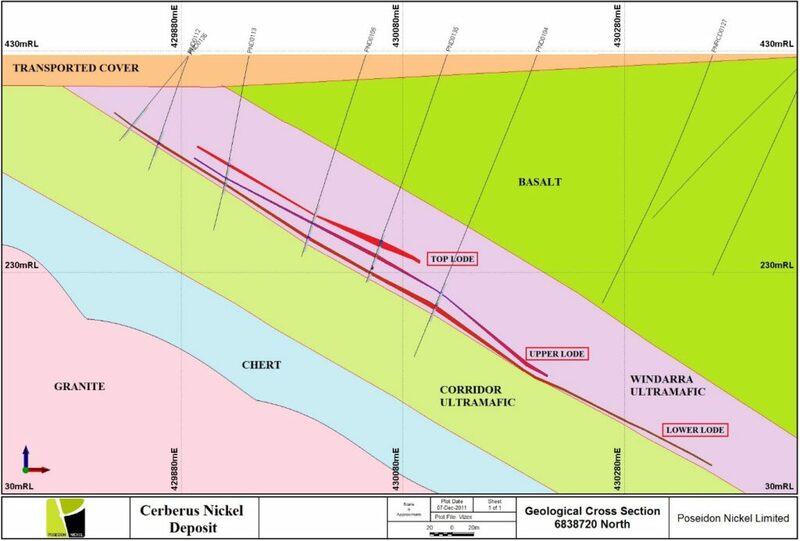 Nickel mineralisation at South Windarra also occurs within the cumulate Windarra Ultramafic as it does elsewhere in the belt, however at South Windarra the channel runs horizontally from west to east, resulting in the plunge of mineralisation almost paralleling the surface. This leads to a significant near-surface opportunity as exploration follows the channel to the east. The deposit was stoped out by granite to the west. 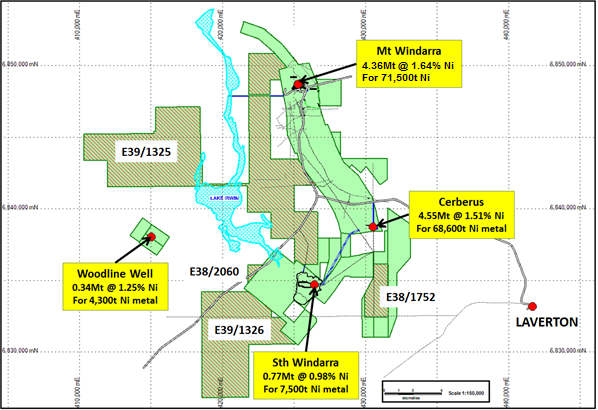 Cerberus is closely located to Poseidon’s existing operations approximately 10.5 km south of the Mt Windarra nickel mine. The mineralisation at Cerberus is blind to surface and is covered by transported material. 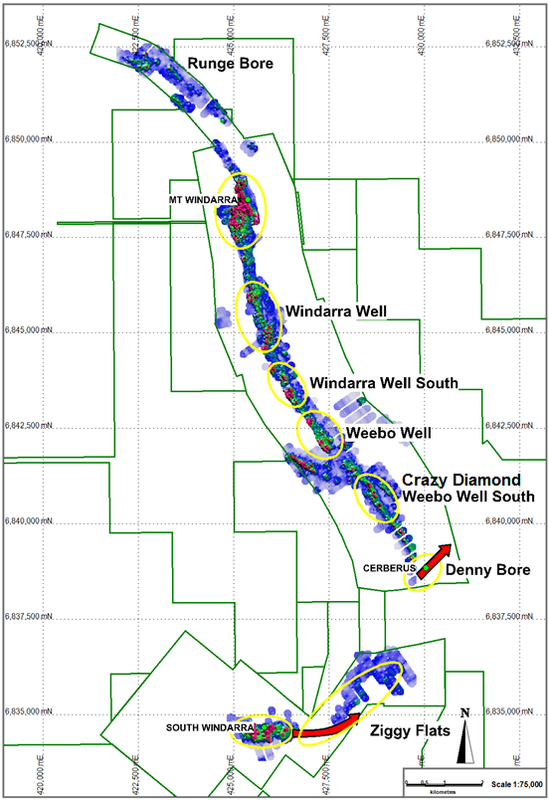 The original discovery hole (WED4) intersected the mineralisation at a depth of 700m vertically below surface. In contrast to typical exploration discoveries, Poseidon has drilled the mineralised lava channel from the bottom up, and has now defined the mineralisation to within 80m vertically below the surface. The mineralisation is around 450m in width and has a continuous strike length of ~1400m. The deposit comprises two lenses of relatively flat lying and north-easterly plunging mineralisation. The upper unit consists of disseminated nickel sulphide whilst the lower unit typically consists of stringer to massive nickel sulphide mineralisation. 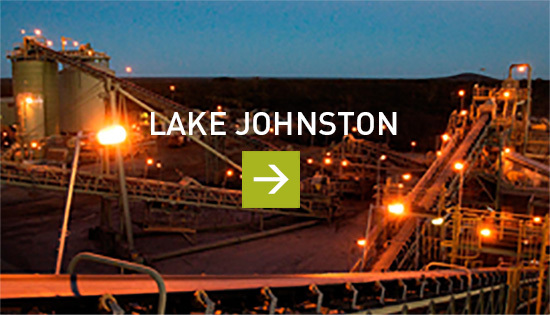 Both are hosted within the Windarra Ultramafic unit. To date a JORC compliant resource at Cerberus of 4.55 million tonnes at a grade of 1.51% has been defined for a total of 68,600 tonnes of contained nickel metal. The deposit is open at depth. From the limited geochemistry available Poseidon was able to generate “hotspots” where the nickel to copper ratios indicate the presence of increased nickel in olivine, and therefore an assumed increase in MgO content indicating lava channel development. Poseidon’s mapping confirms in most cases that olivine cumulate channel material is present at surface and that this corresponds with some thickening of the Windarra Ultramafic, indicating a lava channel. The most significant thickening is observed at the Crazy Diamond Prospect which lies directly north of the Laverton Highway, about 2km north of Cerberus. There is corresponding anomalism in the geochemistry and anomalous grades in historical drilling up to 0.72% nickel. Poseidon has not drilled this prospect and it is by far the best between Cerberus and Mt Windarra. 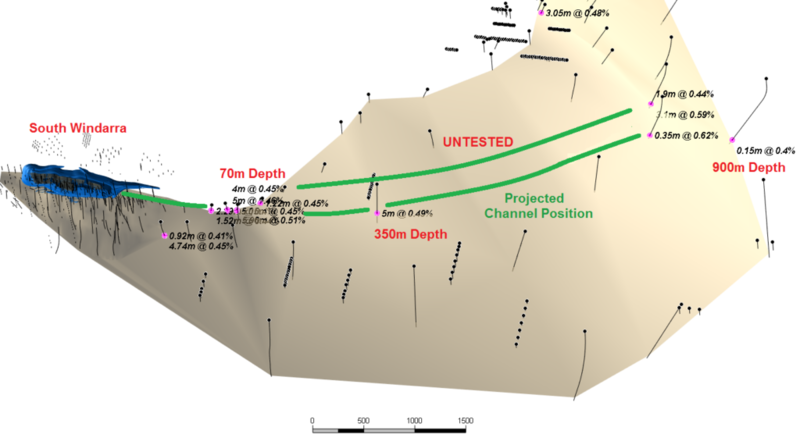 One other prospect of note is Weebo Well where once again anomalous geochemistry coincides with channel cumulate Windarra Ultramafic and anomalous assay grades in historical drilling. It was noted that the historical drilling did not target the Windarra Ultramafic as the holes were drilled too far to the west. Poseidon’s initial view that multiple komatiite channels should exist between Mt Windarra and South Windarra is proving correct.